Chances are you’ve never heard about Phison’s PS5012-E12 SSD controller, but the Gen3 x4 NVMe 1.3 high-performance controller is sampling to customers and it is supposed to be wicked fast thanks to its 8-channel design and on-board cache. Once released, the E12 will be the flagship controller for Phison and it could be around for a number of years as it supports the latest 3-bit per cell TLC NAND Flash chips and even the upcoming 4-bit per cell QLC NAND Flash that is currently being developed by the memory makers. Performance for the E12 looks impressive with sequential performance up to 3400/3000 MB/s for Read/Write performance and 4K Random performance is at up to 600,000 IOPS! The PS5012-E12 is Phison’s 2nd Generation PCIe Gen3x4 NVMe flagship controller and is the successor to the Phison PS5007-E7 controller that was just introduced last year. 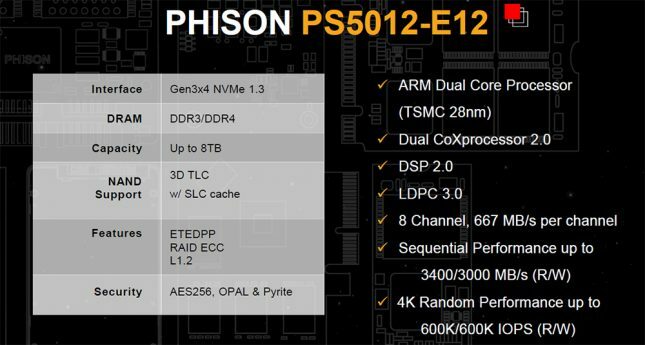 Phison went with an ARM dual-core processor design that incorporated Phison’s latest engineering technologies, from the Dual CoXprocessor 2.0, DSP (Digital Signal Processor) 2.0, and LDPC (Low-Density Parity-Check) 3.0. One interesting bit of information that we picked up from Phison is that they are using TSMC to make the E12 wafers on the 28nm process, which is exactly the same process and fab they used for the E7 controller. For the budget friendly Phison PS5008-E8 controller they went with UMC for wafer production on the 40nm process. Phison was kind enough to send over one of the drives they are sampling to potential customers right now. 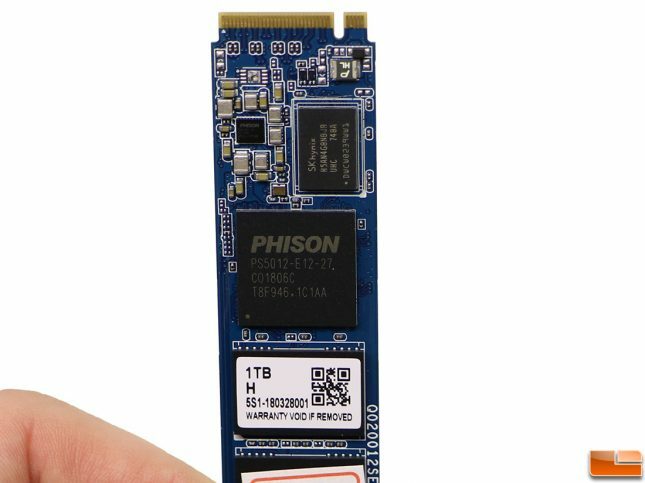 Phison’s customers are in the qualification stage right now for this drive, so once it passes SSDs using the Phison E12 controller will start hitting the market. We expect that could be as early as July 2018 as a number of companies have already announced that they will be bringing this drive to market. In fact, Patriot showed off a Viper M.2 SSD series at Computex 2018 with this controller and MyDigitalSSD has said they will be releasing an BPX Pro M.2 SSD series with this controller as well. We suspect Phison will get some more design wins as we’ve seen Kingston, Corsair, Apacer, Galaxy and other brands bring Phison powered drives to market in recent years. The ‘reference drive’ Phison sent Legit Reviews to try out pairs the new E12 controller with 960GB of Toshiba’s 64-Layer 3D TLC NAND Flash memory (BiCS3) and has 1GB of DDR4 cache on-board. Customers that want to use this controller can use DDR3L if they wanted to could choose from a wide variety of NAND Flash. The early performance numbers today are using BiCS3 and DDR4 DRAM. We expect most customers will initially launch drives with this configuration and then later down the road we’ll see some variations. Phison does not have a proprietary NVMe driver, so we’ll be using the NVMe driver that comes in Windows 10 for testing. Since this is a preview we’ll stop there and get straight to the testing as that is the whole point of this preview.